Hi, i would like to set a background image in notifications, how can i do it? The image i would like to put is a cloud (http://4.bp.blogspot.com/-09TmgXafViI/T7uVW7QBsvI/AAAAAAAAJGg/PJHqGLsNXUM/s1600/CloudMessage.png), so how can i do in such a way that this background widens when the content is large? 1- Open your form to edit. 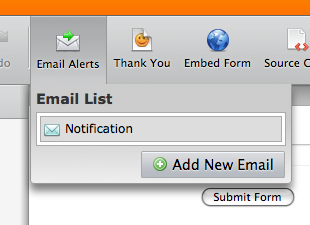 2- Click "Email Alerts" and select the active email notification. 3- Click "HTML" while editing the email. Feel free to look for further help if you need it! We are always glad to assist!